Good news, college hoops fans: The NCAA March Madness iPhone app will support live streaming over both 3G and wi-fi this year. The app will cost $9.99, and there will be a free “lite” version, which includes on-demand highlights but no live streaming. Last year, it was wi-fi only, but cost $4.99, or 50% less. CBS teamed up with long-time streaming partner Major League Baseball Advanced Media to make the app. MLBAM just put out an awesome new app of its own. LOS ANGELES, CA – Mar. 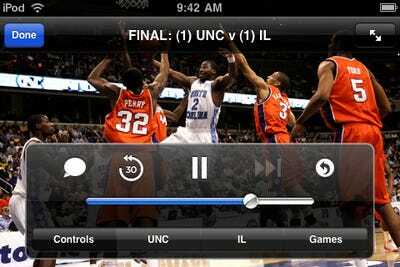 8, 2010 – CBS Sports Mobile, in partnership with CBSSports.com, CBS Sports and the NCAA, today announced new mobile products for the 2010 NCAA Division I Men’s Basketball Championship. Following up on last year’s extremely popular NCAA March Madness on Demand (MMOD) app, CBS is distributing both the premium, live-video app as well as a free “lite” version. The NCAA March Madness on Demand (MMOD) premium application offers live streaming video and video highlights of the 2010 NCAA Division I Men’s Basketball Championship. Coverage begins with the NCAA Basketball Championship Selection Show on March 14 and continues with every game from the first round of the tournament through the semifinals and championship of the Men’s Final Four. New this year, in collaboration with AT&T, the live video will be delivered over 3G, EDGE and Wi-Fi connections. Premium app users can also receive score alerts and listen to live game radio broadcasts from Westwood One throughout the entire tournament, starting with the Opening Round game on March 16. In addition to the premium app, CBS Sports Mobile has also produced a free, “lite” version that is the perfect companion for any March Madness fan. The lite app provides on-demand video highlights from every game, live scores, and comprehensive news coverage of both the 2010 conference tournaments and NCAA Division I Men’s Basketball Championship. Both the free and premium NCAA MMOD apps feature an interactive tournament bracket that updates with real-time scores, plus news headlines and the ability to log into Facebook and Twitter and connect with your friends. Fans can follow the Road to the Final Four®, with exclusive CBSSports.com Edge Matchup game previews, including team breakdowns and matchup comparisons. Users can also make their CBSSports.com bracket selections directly from the app, and track their progress throughout the 2010 NCAA Division I Men’s Basketball Championship. CBS Mobile is also offering live video of the 2010 NCAA Division I Men’s Basketball Championship, through the CBS Mobile Channel on FLO TV. AT&T subscribers of the FLO TV service can watch live video of 63 games from the 2010 NCAA Division I Men’s Basketball Championship, from the first round of the tournament through the semifinals and championship of the Men’s Final Four. The FLO TV™ service is currently available through AT&T, the Exclusive Wireless Partner of the NCAA and other wireless providers to more than 200 million consumers across more than 100 markets. The FLO TV service can be viewed on several handsets from LG, the Official Mobile Device of the NCAA and other manufacturers. For more information, please visit http://www.flotv.com/. NCAA March Madness on Demand (MMOD) is the Emmy award-winning video player that provides live streaming video and audio of the NCAA Division I Men’s Basketball Championship. NCAA March Madness on Demand’s standard video player will launch on March 10 with historical highlights from past NCAA tournaments and be available at NCAA.com (mmod.ncaa.com) as well as via MMOD links on CBSSports.com.